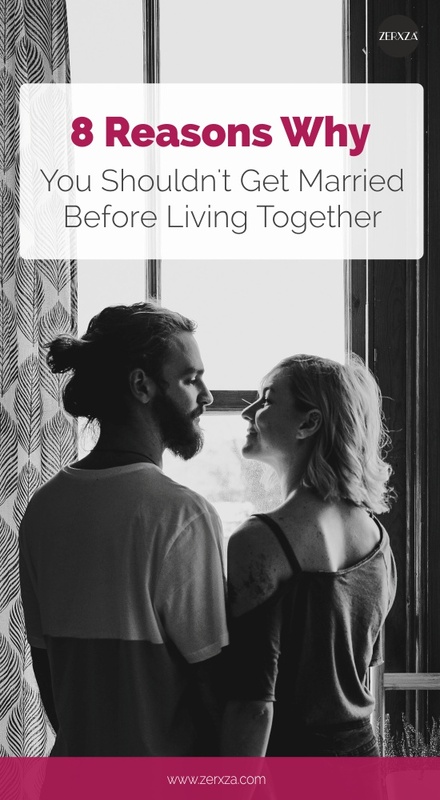 Marriage is a big deal, and so is living with your partner beforehand. Most people have a pretty strong opinion about living together before getting married. For some, it’s a big No. But then there are others who say you shouldn’t tie the knot unless you live with your partner first. And that’s what we’re talking about today. Surveys from the National Health Statistics Reports reveal that between 2006 and 2010, over 22,000 women were interviewed in the United States. 48 percent of these women had cohabited with a partner, which is up from 34 percent in 1995. The report goes on to say that “In 2006-2010, 40% of first premarital cohabitations among women transitioned to marriage by 3 years, 32% remained intact, and 27% dissolved.” Finally, “Nearly 20% of women experienced a pregnancy in the first year of their first premarital cohabitation.” Now, that’s a lot to unpack, but let’s look at those numbers one by one. From the report, it looks like 40 percent of women who live together with their partner before marriage are getting married. But some say this isn’t necessarily a good thing. What is the inertia effect? It’s when living together creates a push toward getting married. It’s when your level of commitment starts to lock you into a relationship that’s difficult to get out of. So, you do what’s expected: you get married. Thanks to the inertia effect created by cohabitation, it can lead to divorce later, or marital dissatisfaction. Of course, this isn’t the case for everyone, and bad relationship outcomes really depend on a wide variety of factors, like the age of the couple, the reason why they decide to move in together, and their overall relationship goal. Living together can increase the risk for inertia effect, but it doesn’t have to. In fact, research also shows that living together before marriage isn’t always a predictor for divorce. In some cases living together before getting married is a smart move. Here’s why. Going out on a date or even spending a weekend together is fun and romantic, but these are often the highlight reels. We all put our best foot forward during these occasions, but when you go back home, you get to be yourself. Sometimes, living together can help you see your partner’s lifestyle, habits and daily routine up close and personal. Having someone to share your daily life with – yes, even the mundane tasks – can be a great comfort and prevent loneliness. Sure, it’s important to have a healthy social life with friends and family members, but it can also be lovely to have your own “family” right at home with you. In earlier times, it was a bit scandalous for unmarried women to live with their significant other. If you wanted that, you pretty much had to get married. It was just such a taboo to do otherwise. That’s not to say that women didn’t live with men without marrying them. They did, but it was socially uncomfortable. Now, you can live with someone and not have to get married. You can enjoy intimacy and commitment without marriage, and what’s more, you won’t be a social pariah for your decision. Dating is fun and exciting: you find special things to do, and you enjoy them together. But day-to-day life is pretty boring. When you live together before tying the knot, you get to see what “boring” life is actually like as a couple. Do you help each other with household tasks? Is there equality and support at home? When you live together, you get to work these things out and see if you’re compatible when the going gets a bit mundane. Yes, this sounds a bit bleak, but the truth is getting a divorce can be expensive and painful. So can a breakup, but it’s generally less expensive and less messy than taking your relationship to court. You can treat cohabitation as a test, but the best way to make it work is to be incredibly intentional about living together. That means you both have discussions about possibly getting married someday. It also means you have an adult conversation about moving together as a step towards marriage. When you have both love and mutual respect for each other, it’s not only possible but actually very necessary to have these conversations. And if you do decide to move in together, this love and respect won’t disappear when you start living together. Instead, you both enter cohabitation as a team, willing to make sacrifices and compromises that help make this new arrangement work. Now, finances shouldn’t be the only motivator for moving in together. That’s fine if you have non-romantic roommates, but if you’re in a sexual relationship with someone, and you’re moving in together simply for logistics, steer clear of this set-up. If finances are your only motivation, you’re setting yourself up for relationship woes. But if you’re in a serious, committed relationship and everything else lines up, living together can be a great way to reduce financial stress and overall expenses. Now that you live together, you can just storm off after a fight happens. You both live in the same home and sleep in the same bed, so you have to face disagreements and work through them together. This is where communication and respect come in – two things that are absolutely crucial for a healthy and long-lasting relationship. When you live together, there will be plenty of opportunities to practice communicating and showing each other respect even when it’s challenging. Some say you shouldn’t live together before you get married. But there are actually plenty of good reasons to share the same space before tying the knot. Do you agree?